Heavy Rain is a very interesting game. All of the developer interviews and previews hailed it for innovation and its amazing cinematic experience. But with so much hype and expectation from both fans and critics, did the latest from Quantic Dream manage to meet expectations? It is safe to say that is has, as the game offers a very unique and engrossing setting that you’ve not experienced before. From the interesting and original control display to the emotional drama that unfolds before you, Heavy Rain is an amazing journey from start until almost the very end. It does have shortcomings, as unfortunate as that is, but they are minor gripes with an experience that may greatly differ to your own due to the game’s fast selection of player choices and outcomes. Towards the end of the game everyone’s storylines must come together into one, and this does cause some problems with the story. It was undoubtedly difficult to create an experience with so many player decisions and yet make it all come together in the end. If you are looking for a very atmospheric story that plays out like a blockbuster thriller, or if you are simply a fan of Indigo Prophecy - the previous game from the developer – you should most definitely give Heavy Rain a playthrough. One of the main selling points of the game is the story and the cinematic experience. While other titles in recent years, such as Uncharted 2, proved that games are more than capable of creating gaming alternative to the loud summer blockbusters, there was still a gap in the games library for emotionally moving cinematic experience. With Heavy Rain, this void is now filled. Indeed, right from the outset, the game puts you in control of four different characters that go about their lives as usual, until a string of events begins to unravel and eventually bring them all together somehow. The game starts off with the player performing very mundane tasks such as brushing a character’s teeth, preparing breakfast or playing with his kids. Not only do these introductory levels setup the main characters and the story to come, they also act as a seamless tutorial for the game. The main protagonist of the story is Ethan Mars, a happy married man who witnesses and feels responsible for the death of one of his children. Two years later, he is a broken man barely keeping his life together while spending whatever time he can with his last son. Soon, events occur and his son is kidnapped by the mysterious Origami Killer, a serial murderer who has been kidnapping kids and drowning them in rain water five days later. And such begins the desperate struggle of our main character to find his son, while following mysterious instructions that require him to perform many horrific challenges. Meanwhile, a private detective Scott Shelby begins his own investigations into the killings, as requested by the families of the kids; the police bring in an FBI profiler Norman Jayden; and a photojournalist Madison Page also begins her investigations. All of these characters eventually discover or come across one another, and depending on how the player performs at certain tasks or decisions taken, they may all die or may all live. The story’s uniqueness comes from the player’s ability to continue with the story even if one of the characters dies either via a decision or a failed action sequence. There are said to be over 20 unique endings in the game, with 7 being vastly different. This offers huge replayability to the title, as well as the possibility of very different player experiences that will be discussed and shared with peers for many weeks. Some scenes have an impact later on in the game, while others are simply experience that help you get to know the character and make difficult choices on the spot. Of course, you do not know which decisions will come back to haunt you later so it makes for a thrilling first time playthrough. The main story arc is a very unique and emotional experience, depending on how the player takes care of the characters along the way. 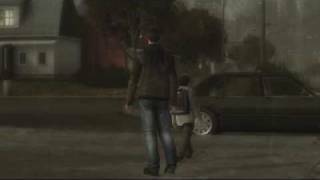 Regardless of player choices, some parts of the story cannot be missed and as such Heavy Rain is a very atmospheric, mature and thrilling cinematic experience. All of the characters you encounter have unique personalities, problems and ways about doing things. The player not only gets to play through the action scenes, but also oversees his characters doing everyday tasks such as cleaning up, working on evidence and even eating. These interactions may seem boring to some, but they provide a window into the characters and create an emotional attachment that most games fail to achieve. Heavy Rain is unique, but not always as you expect. While there are a lot of games and films that may be a bit slow and boring but have an explosive conclusion, Heavy Rain suffers from quite the opposite. While the majority of the game is a thrill ride that’s more than worth the price of admission, the big story twist and consequent ending fall a bit flat. It was likely difficult to offer so many unique endings and try to create a fun experience for everyone, and so the ending suffers from many loose ends and unclear character fates. Nontheless, this is still very much a game that must be played for the story, characters and atmosphere that it creates. For those who’ve played Indigo Prophecy (aka Fahrenheit) will actually feel very familiar with some of the gameplay mechanics used in Heavy Rain. The characters still walk around awkwardly and bump into the world objects and walls, and the directional analog direction represents a possible action when near an interactive objects. The quick time events also make up a large part of the gameplay, but things have evolved and changed a fair bit since the days of Indigo Prophecy. In Heavy Rain, the control scheme is represented with floating options that correspond to your controller buttons when you approach a character for conversation. The number of options varies depending on the tone and characters involved in the conversation. The options also blur and jitter around to represent the character’s current state of mind – comfortable, worried, scared, etc. There are also sections in the game where the player is required to hold more than two buttons at the same time in order to perform an action. These sequences are physically demanding on your hands, and often accurately represent the physical action that the character is performing. Major action scenes in the game utilize quick time events - sequential button prompts that give you a short amount of time to press a certain button. But, unlike other games that employ QTE extensively such as God of War series, failing a few prompts in Heavy Rain does not abort the whole sequence. Instead, the game dynamically adapts to reflect the prompts the player has missed, and the ending is only altered if the player fails the majority of the prompts. This makes the game impressively adaptive to every action scene and player experience levels, providing for interesting outcomes depending on the prompts missed in various playthroughs. The QTEs also utilize the SIXAXIS controller motion to a great extent to keep the player involved in the action. When compared with Indigo Prophecy, these QTEs are much more user-friendly and polished than the “Simon Says” gameplay of the aforementioned title. There is also the ARI system that only the FBI agent can utilize, it allows the player an alternative view of a crime scene to discover clues and hidden objects. Later, you are able to process all the evidence in a very cool setting inside the virtual environment. One problem that remains with the developer is perfecting the fixed camera system – Heavy Rain offers no manual camera controls, and as such there are moments of frustration when you cannot see the room at the angle you wish to, and have to awkwardly manoeuvre your character into place until the camera is able to lock on to a better location. One of the most exciting factors about Heavy Rain when it was first revealed was the graphical level of detail. Now that the game has finally been released, it’s amazing to see the kind of graphical advancements that technology of the game has made. The characters look extremely detailed and realistic, nearly approaching the photorealism of PC-only Crysis on maximum level of detail. While everyone looks very detailed and the frame rate is solid, the amount of graphical load does take its toll. There is infrequent but noticeable screen tearing throughout the game, and some odd animations and very poor lip syncing sections ruin the immersion somewhat. Still, the visuals in the game are very good and often surpass that of last year’s Uncharted 2 when it comes to indoor environments and characters. Granted, the rain effect in the game is very well done and continues to be a central graphical showpiece through the whole game. The character acting in the game is solid, if you can forgive the fake American accents of the voice actors and some odd dialogue lines tailed to stitch the story together for the players who took various decision paths. Atmosphere cannot be created with visuals and characters alone though, and Heavy Rain packs an extremely well-placed soundtrack and adapts very well to different scenes and characters, while dark and moody melodies continuously fill the background. The tone is set with every scene, and feeling of desperation and sadness often creep into the music and add to the already exhausting emotional experience. It is difficult to make a specific judgement on Heavy Rain, as the game offers so many different experiences not only in the many endings, but in the way each scene may play out different from one player to the next. As such, the game offers tons of replay value and unique experiences for everyone who picks it up. First and foremost though, it is an emotional and gripping thriller with strong characters and an exciting story arc that falls just a bit flat towards the end. It is also a game that should be praised for its innovation in the way games are not only experienced, but also controlled. It is an exciting and involving experience that will immerse the players in a very disturbing, and yet mysterious world that the players will not want to leave without knowing what happens next. With unique controls and presentation, the game is very fun to play, and the only issues that arise are minor gripes, such as the fixed camera system. Heavy Rain is a very impressive technological achievement as well, providing very detailed character models and mostly fluid animations, only with a few quirks and lip sync problems. The game’s characters are unique and memorable, with the voice acting and a great musical score only adding to the deep level of player immersion. Heavy Rain is definitely the dramatic and mature cinema experience that the developers set out to create. With just a few technical and story issues holding it back from excellence, it should not be missed by any adventure fans. A unique scheme that utilizes all possible ways to use the controller in imaginative and creative ways, some stellar atmosphere created by visual effects and the musical score. Interesting new menu presentation and dynamic QTE sequences add tons of replay value just to see what could happen. With at least 7 major different endings and tons of small scene variations, the player experiences will vary greatly, offering a lot of replay value. A dark and dramatic story that must be experienced. While technically impressive, there are some animation and lip sync issues that appear with irregular frequency. A mature cinematic thriller that does so many things right, it is easy to forget the small number of issues. Unique and emotionally draining, it's a title that you should not miss. Haha, this game was one of the main reasons I invested in a PS3 a few months ago. I think this may be my Game of the Year. I know it's early, but it just might be.